Why do we need a Leap day? Although most years of the modern calendar have 365 days, a complete revolution around the sun takes approximately 365 days and 6 hours. Every four years, during which an extra 24 hours have accumulated, one extra day is added to keep the count coordinated with the sun's apparent position. The Chinese lunar calendar also incorporates leaping (if there is such a word to describe it), not leap days but leap months. Certain years, there are thirteen months in a lunar year and it is not restricted to any particular month. 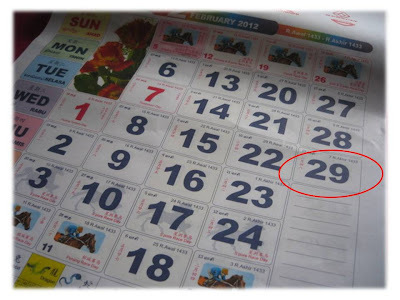 How is the leap month determined? So, happy Leap day, Everyone! Do something nice today, something memorable or something bad which it won't come back to haunt you until four years later! LOL! So now the Thai community is also considered "Sons of the Soil?! You know that the General Election is drawing near. I quote article in The Star today..
PENDANG: The Thai community has been assured that they are entitled to bumiputra benefits and privileges. Datuk Seri Najib Tun Razak said the community had long been recognised as bumiputra, adding that their loyalty to the country was unquestionable. The Prime Minister said even Umno recognised them as bumiputra and allowed Malaysians of Thai descent to set up party branches. “I would like to state that the Thais here are regarded as bumiputras and I will ensure that they are truly recognised and enjoy the bumiputra privileges. “They have been loyal to the country. Former prime minister Tunku Abdul Rahman had declared the Thai community as bumiputra and today, I reiterate this. “They are entitled to purchase Amanah Saham Bumiputra shares, enrol in Universiti Institut Teknologi Mara and can apply for various Mara loans, among others,” he said when meeting the Thai community at Wat Titi Akar and Wat Nanai yesterday. He said when the political tsunami hit the country and the state in 2008, the community's support for Barisan Nasional remained strong. Najib also said that when he introduced the 1Malaysia concept, it was to further elevate the spirit of tolerance to acceptance. “To realise this, there must be a change in mindset and attitude. The time has come for us to accept the diversity rather than just tolerate it,” he said. Najib said aside from globalisation, the process of localisation was also being pursued by the people. He cited the setting up of the Thai language school by the community as part of efforts to preserve their culture and tradition as example of localisation efforts. The Prime Minister announced an allocation of RM500,000 to the Thai language school in Wat Titi Akar and RM9,000 each to the 48 wats in Kedah. Earlier in Gurun, he said unity among Malays was the key to national unity. Najib said Malay unity could be reflected in many ways, including through associations such as silat groups. Najib said the struggle for the country did not end with Malaysia achieving independence but should continue until the country and Malays achieved excellence. The Prime Minister was bestowed the “Imam Khalifah Agong Gayong” award by the Seni Silat Pusaka Gayong Malaysia organisation. His wife Datin Seri Rosmah Mansor, was presented with an award which carries the title “Sri Pelangi Srikandi Utama”. If you subscribe to satellite tv Astro's Biography Channel, you would be able to watch a documentary tonight on Sabah - a view of the state's landscape from the air. Professional photographers, Jonathan Tan and Cede Prudente, will take to the skies in the programme called Shoot For The Sky on Astro's Channel 731 at 9pm in which they will fly over Sabah to take images of Sabah from the air. For this assignment, they learned to fly in a powered paraglider or paramotor, to get a bird's eye view of some of the amazing sights in the state, dubbed Land Below the Wind. Their journey will take them across Sabah's dense tropical rainforests and breathtaking locations such as the long Sandakan coastline, picturesque Semporna islands and majestic Mount Kinabalu. Below is but one stunning image from their adventure. For more, visit Documentary on Sabah - Shoot For The Sky. In the meantime, let me leave you with a trailer of the documentary on Bio channel..
On Sunday, January 8th, 2012 tens of thousands of people took off their pants on subways in 59 cities in 27 countries around the world. In New York, our 11th Annual No Pants Subway Ride had nearly 4,000 participants, spread out over six meeting points and ten subway lines. Friday Frolics - What Adjective Describes You? Here is this week's Personality Quiz - What Adjective Describes You? It's raining right now in Kuala Lumpur though the temperature outside is 91degF. Hope you are having better weather wherever you are. Your friends would describe you as a perfectionist. You are very detail oriented. You believe that people should do things right, and that includes yourself. You are very sensitive and observant. You notice everything, and nothing slips past you. You see opportunities where others do not. You are very creative and resourceful. While Argentina is going through the worst train disaster in 40 years, Brazil just concluded their famous annual carnival. It was Samba and glam time as Brazil celebrated Carnival where Samba school dancers took to the streets of Rio de Janeiro. 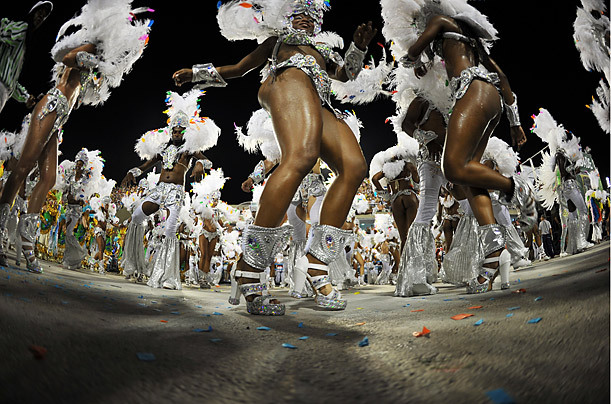 A reveler from the Vila Isabel samba school dances on the first night of the annual Carnival parade in Rio de Janeiro's Sambadrome on Feb. 20, 2012. 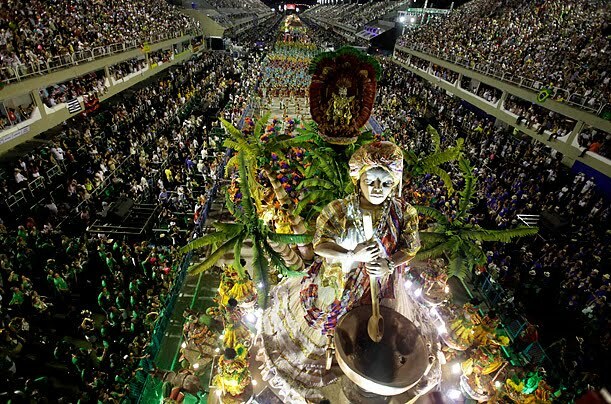 Carnival, the biggest and most popular celebration in Brazil, happens in the days leading up to Easter, running all over the country from February 17 to 21. The Imperatriz samba school parades on the first night of the annual Carnival parade in Rio de Janeiro's Sambadrome, Feb. 19, 2012. 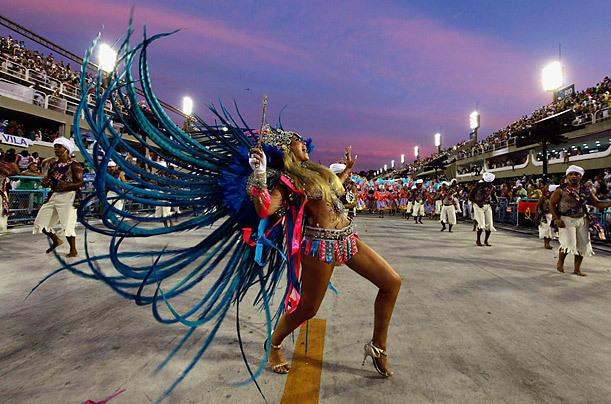 Dancers from the Mocidade samba school perform during the first night of Carnival parade at the Sambadrome in Rio de Janeiro on Feb. 20, 2012. Oh dear, another crash disaster. 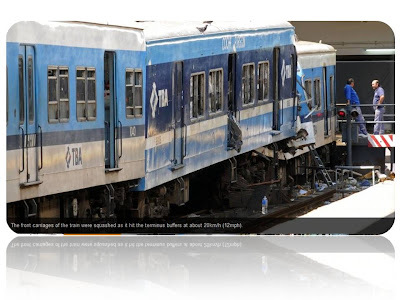 This time it's a commuter train crash in Buenos Aires, Argentina. According to officials, at least 49 people have been killed and more than 600 injured in the worst train crash in Argentina in 40 years. 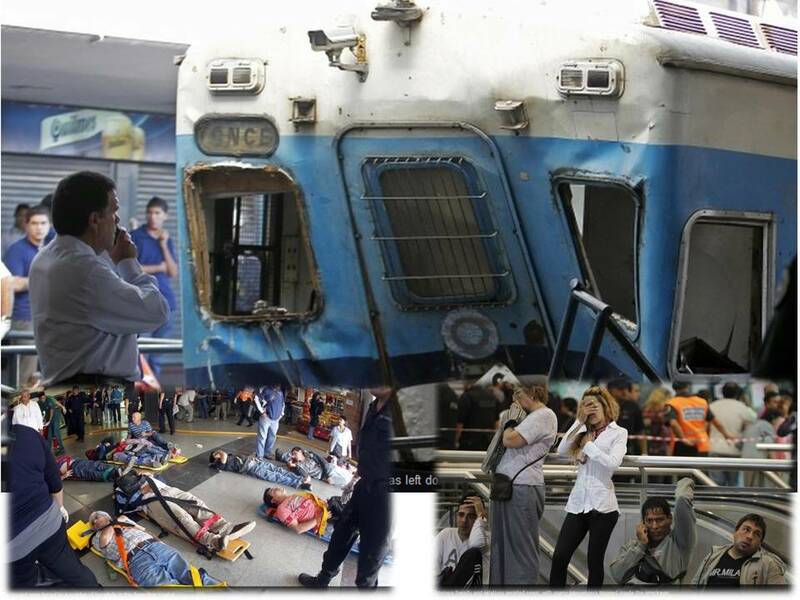 The train hit the end of the platform at Once station in the capital Buenos Aires during the morning rush hour. Dozens of people were trapped for hours in the wreckage but all have since been taken to safety. Two days of mourning have been declared and planned carnival festivities in the country have been cancelled. The front carriages of the train were squashed as it hit the terminus buffers at about 20km/h (12mph). Unlike here in Malaysia, train lines in Argentina are not state-owned and many parts of Argentina's rail network are antiquated and in need of repair. This incident will increase concern about lack of investment in the system. In September 2011, 11 people died when a commuter train in Buenos Aires hit a bus crossing the tracks and then hit a second train coming into a station. 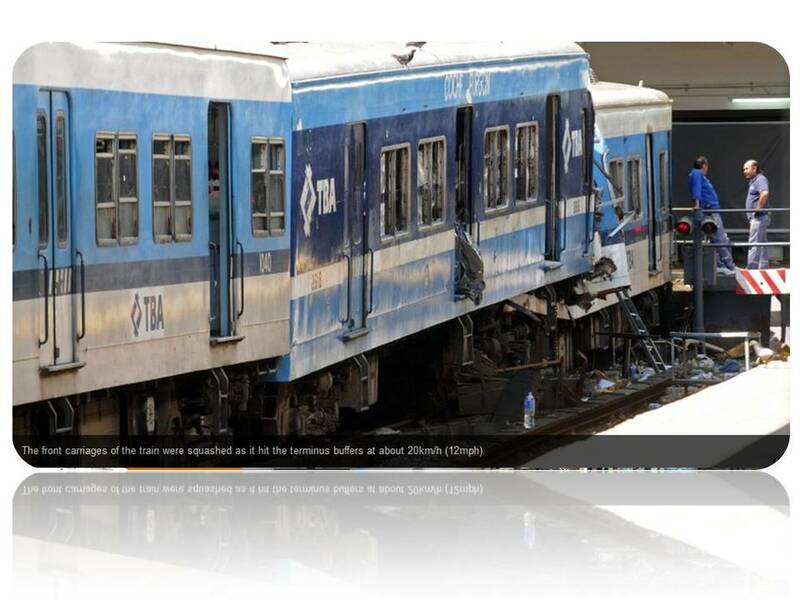 This latest accident is Argentina's worst train crash since February 1970, when a train smashed into another at full speed in suburban Buenos Aires, killing 200 people. I realised I haven't shared a joke in a while. This one came in the mail this morning. Don't pin the people to the ones in the images though. I'm sure they are just for illustration only. 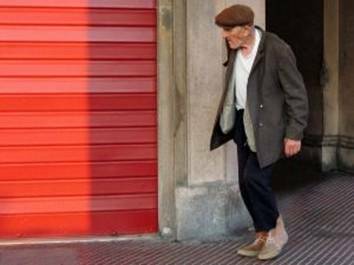 Enjoy..
when an old Grandpa walked by. "We bet we can tell exactly how old you are." "There is no way you can guess it, you old fools." "Sure we can! - Just drop your pants and under shorts and we can tell your exact age." "How in the world did you guess?" "We were at your birthday party yesterday!" Adele has done it again, this time at the BRIT Music Awards held yesterday. 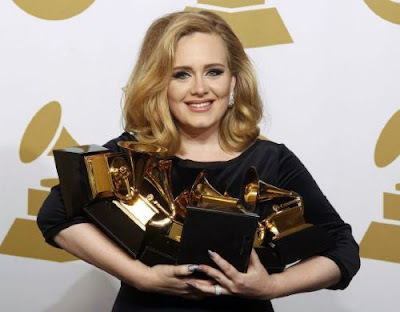 Adele sang the same song earlier this month at the Grammys, where she managed a record-equalling six awards in one night. The only BRIT award she did not win from three nominations was best British single, which went to TV talent show contestants One Direction for "What Makes You Beautiful". Let's watch her perform at the BRITs. Enough already? One more time? I'll throw in lyrics this time for you to sing along. Now this is something interesting. If you enjoy flashmobs, group activities and such, this activity should provide some entertainment or fun if you participate. 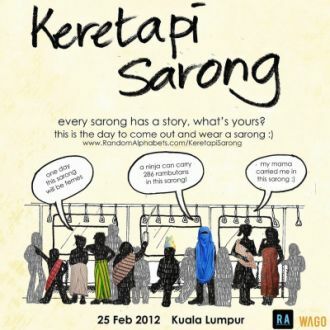 Come Saturday, Feb 25, expect hundreds of people dressed in colourful sarongs to flock to trains in the city, Kuala Lumpur. Observers can take pictures, smile or wave at participants. The Keretapi Sarong poster that can be seen all around Taman Tun Dr Ismail, Kuala Lumpur. Keretapi Sarong is an event inspired by No Pants Subway, a flashmob which, in 2009, organised 1,200 New Yorkers to ride the subway without wearing pants in a snow storm. The event is organised by RandomAlphabets (RA) with the objective to bring people together and have fun. RA is a non-profit organisation that puts together event-based projects in and around Kuala Lumpur. 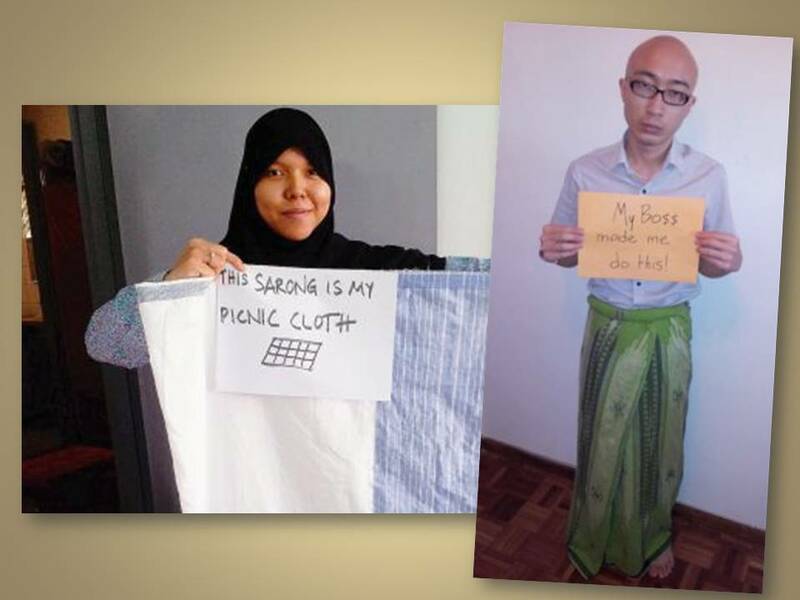 Participants are encouraged to write their “sarong stories” on a piece of A4 paper and hold it up during the event like them below..
At the end of it, these “sarong stories” will be posted on the Keretapi Sarong official website (www.keretapisarong.posterous.com) as well as on RA's Facebook page. Your chance at fame here. Keretapi Sarong is scheduled for 4pm on Saturday. The venue will be announced on the website today. The Water Dragon this year may be true to its word. 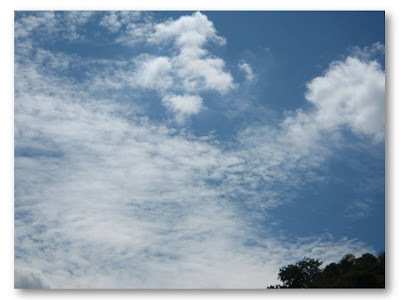 Some days, like yesterday, Kuala Lumpur skies can be as blue and beautiful as this, the image below. If you stand back a little, with some imagination, you may even spot a face or two smiling down at you. Other days, like today, the sky can be this grey and unfriendly. Everyone says the weather nowadays is not what it used to be some years ago. Temperatures can go so high that people flock to shopping malls and complexes to get some respite or it can get so cold with hours of rain that you don't feel like venturing out. And talking about the rain, Ipoh was flooded yesterday after a six-hour downpour. Ipoh is a city in the northern part of Peninsula Malaysia in the state of Perak. Water overflowed river banks flooding villages and schools. Evacuation had to be carried out in places badly affected. Residents said the water reached waist level at the height of the floods which started at about 4am yesterday according to The Star. If you are visiting Malaysia for the first time, it would be good to know a little about the Malaysian weather. Malaysia being in the tropics, and just above the Equator, goes through two different monsoon seasons. 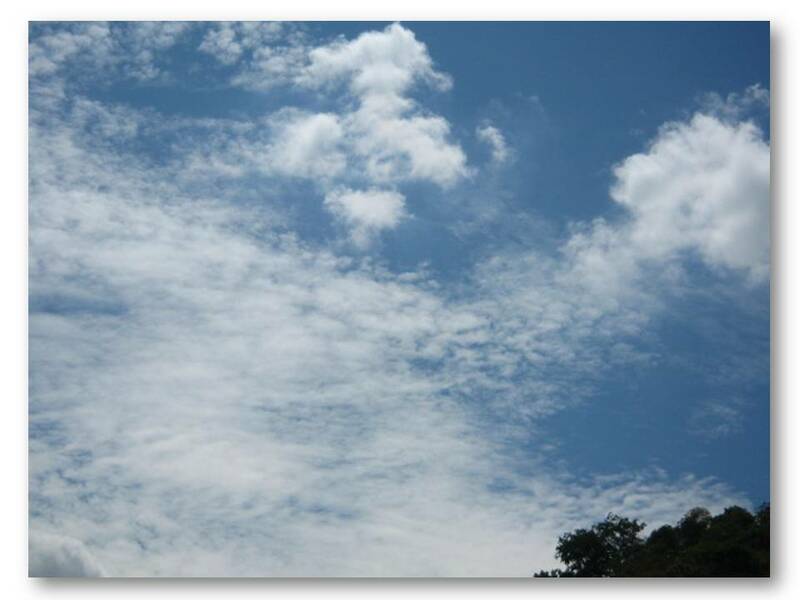 The Southwest Monsoon is from late May to September, and the Northeast Monsoon from November to March. The Northeast Monsoon is characterised by heavy rainfall, particularly in the north-eastern states of Peninsula Malaysia (viz., Kelantan and Terengganu) and western Sarawak on the island of Borneo. 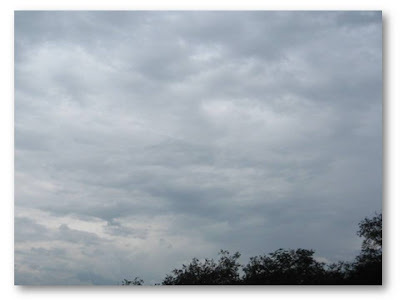 The Southwest Monsoon is milder with winds coming from the south west and normally signifies relatively drier weather. Heavy downpour is also expected which may cause flooding in low-lying areas. The intermonsoon period is the transition period between the monsoons. A point to remember when visiting Malaysia is to time your visit away from monsoon months especially if you are visiting the east coast where there are many resorts popular with foreign tourists. 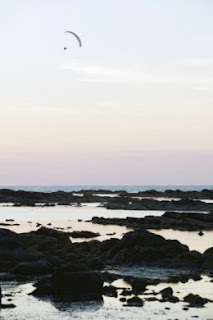 These resorts include the islands of Redang, Perhentian, Tioman including Club Med Cherating in Kuantan as well as the beaches of Terengganu where watching greenback turtles laying eggs is a popular activity. However, if you are visiting the west coast of Peninsula Malaysia, anytime of the year is a good time. As the weather changes without warning sometimes, it would be advisable to pack an umbrella or a raincoat. Timing your visit to coincide with major festivals may allow you to enjoy the country more. Major festivals here are Aidil Fitri, Chinese New Year, Thaipusam, Christmas, Dragon Boat festival (Penang), Nine Emperor Gods Festival, the latter to witness the fire-walking ritual. Malaysia is a paradise for shopping, everyone knows that. For a greater shopping experience, visit during the months of July and August. This is the period of the annual Malaysia Mega Sales Carnival with discounts as much as 70% off the usual price. Oh, but I digress. What can I say, Malaysian weather may be hot and humid but I wouldn't trade it for any other. Psst.. if your winter is too cold and dreary, come on over. We've got plenty of blue skies and all things nice. I guess this must be the most-searched video in Malaysia currently after news broke that an Arab guest in a backpackers lodge flew into a rage over couple’s kiss at lodge. It happened in Kota Kinabalu, Sabah. The guy didn't pay the bill according to comments on You Tube. Her family didn't call it a funeral but instead named it Homegoing. 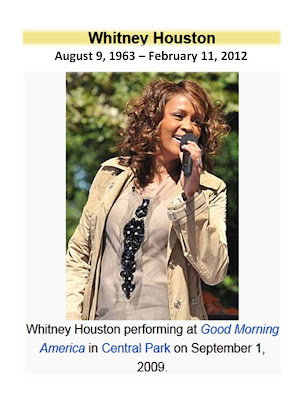 The Whitney Houston Memorial began at 1:30am local Malaysian time and didn't finish until almost 6am this morning. I stayed up to watch to bid farewell to an icon in the music industry whom millions around the world will miss for a long, long time to come. As TIME magazine put it, In Turns Poignant and Rousing, Friends Celebrate Whitney Houston. 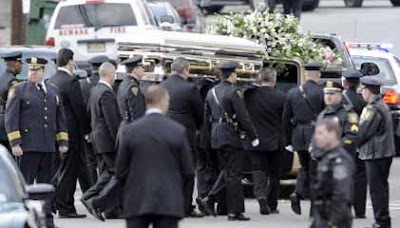 Below are a sample of expressions and performances by friends and family celebrating Whitney's life. Let's start with Kevin Costner, Whitney Houston's co-star in The Bodyguard who singled out Whitney to play the part. It was her first movie role. 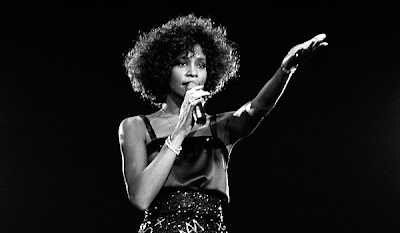 Filming was delayed by a year for Whitney to complete her tour. Keys choked back tears as she remembered her close friend Whitney Houston for “[t]he way she crept into everybody’s heart, the way she was a beautiful human being…She’s an angel to us, and a beautiful human being. I think we’ve been sent an angel for a long time.” Her stirring rendition of “Send Me an Angel” paid tribute to this facet of Houston’s personality. The family of Whitney Houston does not plan to open the funeral service for Whitney Houston to the public. Attendance to the private funeral will only be by-invitation only to close friends and family. Also spotted at the funeral home (Whigham funeral home in Newark, N.J., on Friday) : Houston's mother, Cissy Houston, Dionne Warwick and Clive Davis, among others. Other celebrities and personalities expected at the funeral include Aretha Franklin, Brandy, Rev. Jesse Jackson. Houston's rep, Kristen Foster, reportedly told RumorFix. Other confirmed guests include Chaka Khan, Bebe & CeCe Winans, songwriter Diane Warren, pop singer Darlene Love, Bishop T.D. Jakes, Antonio "L.A." Reid and Ray J. However, Associated Press has been allowed to have a camera at the venue for livestreaming for fans around the world to bid farewell to the pop star. In New Jersey, Governor, Chris Christie has ordered flags flown at half-staff at state government buildings on the day of the funeral amid a number of complaints registered in emails and other messages. The Governor answered his critics by saying that he was not claiming Houston was a role model, but that she deserved the tribute because of her huge cultural impact and as a famous "daughter of New Jersey." 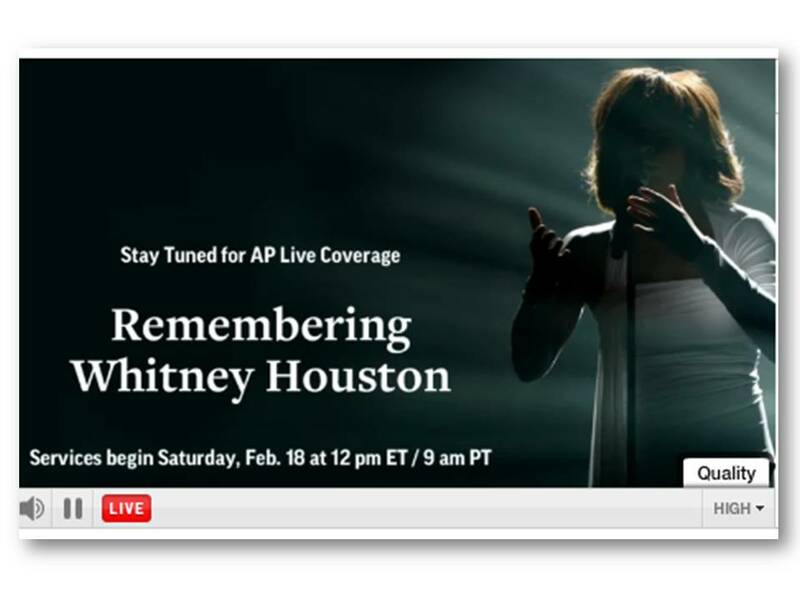 Fans who want to bid Whitney Houston farewell will also be able to watch her private funeral on E! 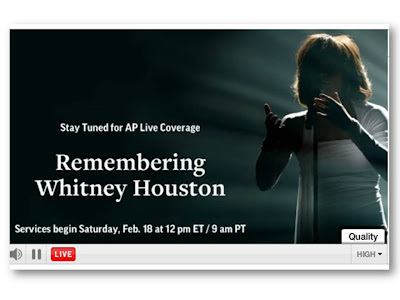 - Whitney Houston Memorial Live. In Malaysia, it will be on Astro Ch 712, 1:30am, Sunday. Aretha Franklin and Stevie Wonder have been reported that they would sing at the funeral. Kevin Costner, her co-star in The Bodyguard, and Clive Davis, the person who discovered Ms Houston and a close friend are expected to speak at the funeral. The eulogy will be given by gospel singer and longtime family friend, Marvin Winans. Whitney Houston was born in Newark. She died in Beverly Hills, Calif., on Saturday at the age of 48. Her body was flown back to her native New Jersey on Monday. Friday Frolics - What's Your Ideal Pet? So, you are thinking of getting a pet to keep you even busier but not sure what pet to keep? This week's Friday Frolics personality quiz may be able to help you decide. Though the reading for me is not entirely true but it makes me laugh, the last bit, that is. Enjoy..
You're both aloof, introverted, and moody. And your friends secretly wish that you were declawed! Work is Hard. Time for Friday Frolics! The new Malaysian coins are now in circulation. Was elated (I'm simple like that) when I received at a checkout counter a 10-cent new coin yesterday. No surprise actually because I've seen the whole set of the new coins. In fact, I own a mint set of the new coins as well as a full set of the new notes of the new series of Malaysian banknotes. According to Bank Negara Malaysia, the exercise of issuing new banknotes and coins is undertaken periodically every twelve years. 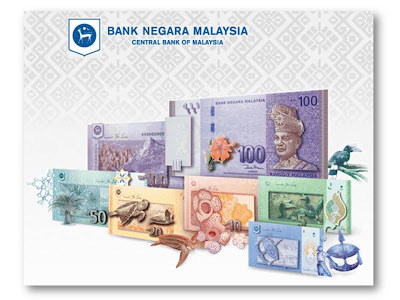 The theme of the design of the new currency series includes features that are distinctively Malaysia. It also has enhanced security elements in line with the latest advancements in technology for currency notes. The new fourth series design of banknotes feature in the denomination of RM1, RM5, RM10, RM20 and RM100. The current design of the RM50 banknote already in circulation since December 2007 to commemorate Malaysia’s 50th Anniversary of Independence will continue to remain in circulation. The new design coins are the third in the series for the denominations of 5 sen, 10 sen, 20 sen and 50 sen. This new series of banknotes and coins will co-circulate with the existing series until the latter are gradually withdrawn from circulation. The Star today highlighted problems encountered with the new coins at parking autopay machines. I remember we used to have this problem when the one ringgit coin was introduced. If you are heading to Thailand, you may want to be alerted on possible violent incidents in the country following Tuesday's bomb blasts around Soi Sukhumvit 71 in Bangkok. In a latest development, four more countries, Italy, Norway, Israel and Taiwan, have issued warnings to their citizens in Thailand to be aware of possible violent incidents in the country. On Wedenesday, ten countries issued warnings. They are Canada, the United States, the United Kingdom, Ireland, Austria, the Netherlands, Japan, South Korea, Brazil and New Zealand. The suspects involved in Tuesday's multiple bombings in Bangkok were part of the same network of terror involved in bomb incidents in India and Georgia earlier this week, according to Itzhak Shoham, Israeli ambassador to Thailand. If you are in Singapore from Feb 14 until 19, you may want to take in a visit to the Singapore Airshow 2012 at the Changi Exhibition Centre. This is Asia's largest airshow and one of the three most important aerospace and defence exhibitions in the world. Plus, you will get to see actor, Jackie Chan's Embraer Legacy 650 which is making its first public appearance since delivery to the international movie star. 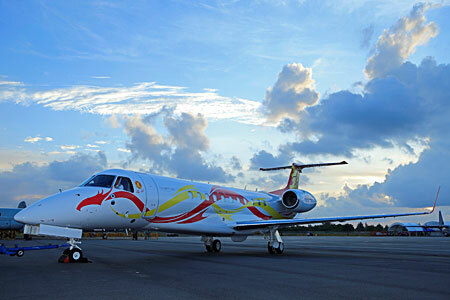 Jackie Chan's jet, with its distinctive dragon motif, is also the first Legacy 650 to be displayed at the Singapore Airshow. The US$30 million (S$37 million) jet left Brazil to meet him in Singapore. 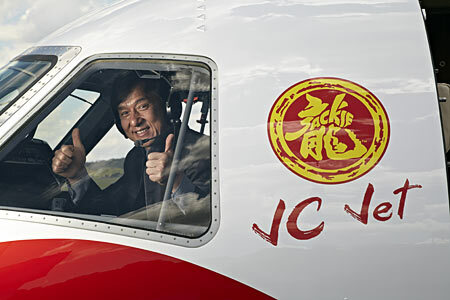 Jackie Chan offered to be Embraer's Brand Ambassador, especially for China. 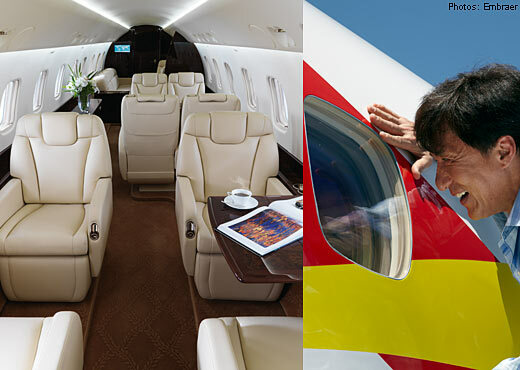 "I chose the Legacy 650 because its large three zone cabin, offering incredibly quiet performance and luxury," said Jackie Chan. The Legacy 650 is very spacious with three distinct cabin zones, a wet galley and the largest in-flight accessible baggage compartment of its class. Jackie's plane can hold up to 13 passengers and is capable of up to eight-hour flights around Asia and elsewhere. For you who are familiar with aircrafts, the Legacy 650 range is 3,900 nautical miles (7,223km) affording such nonstop distances as Beijing to Dubai, United Arab Emirates, and Hong Kong to Adelaide, Australia, carrying four passengers. Its state-of-the-art cockpit includes the Honeywell Primus Elite avionics suite, greatly reducing the pilot workload and enhancing safety. With three distinct cabin zones, the Legacy 650 is the only jet in its class with this level of comfort. Advanced Wi-Fi technology and significantly reduced cabin noise means the Legacy 650 ensures an environment in which passengers can work or rest. It includes a fully equipped wet galley and the largest in-flight accessible baggage compartment, something Embraer is known for. This one is primarily for US readers...a call for action. For the rest of us, it carries a message that we could all benefit if we also have this kind of gesture in our own country. Sharing article from The Malaysian Insider with regard to Muslims celebrating Valentine's Day. KUALA LUMPUR, Feb 14 — All Malaysians including Muslims should be allowed to celebrate Valentine’s day, Datuk Seri Nazri Aziz said today. “Why can’t it be celebrated? I disagree...it is not a form of prayer,” said the defacto law minister. He was asked to comment on Islamic affairs minister Datuk Seri Jamil Khir Baharom saying that Islamic religious authorities have launched nationwide enforcement efforts to nab Muslims celebrating Valentine’s Day today. “What is wrong with Valentines’ day? People just want to express their love to one another. “How different is it from other days, where we can do the same thing?” Nazri asked. He also criticised PAS for campaigning against Valentines’ Day, saying that such efforts were plain “ridiculous”. 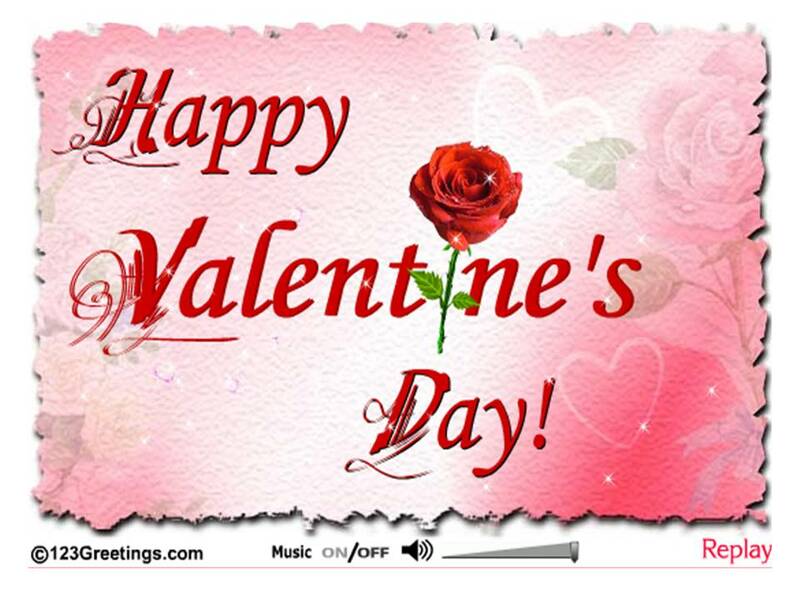 Last Friday, official sermons also warned Muslims against celebrating Valentine’s Day, which the federal Islamic authorities claimed was in breach of the tenets of their religion. 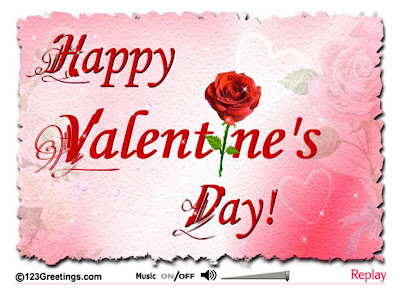 In the text of a sermon provided by the Department of Islamic Development Malaysia (Jakim) titled “Awas jerat Valentine” (Beware Valentine’s trap), Muslims were told that asking someone to be his or her “Valentine” could lead to idolatry. PAS Youth has also been spearheading anti-Valentine’s Day celebrations in recent years. It claimed that the celebrations would lead to greater vice among Muslim youths. This year, the Islamist opposition party’s Youth wing urged the federal government to exert greater control over Valentine’s Day advertisements to curb social ills. Valentine’s Day celebrations have been a solely commercial affair since 1969, when the Roman Catholic Church dropped February 14 as a feast day. 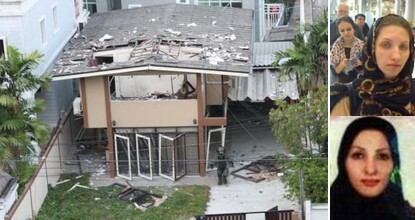 Two explosions boomed through a busy neighbourhood in the Thai capital on Tuesday, police said, with reports stating an Iranian man may have been responsible for the attacks. A picture posted on Twitter purportedly showed a wounded man laying on a pavement strewn with broken glass outside a Thai school, his legs apparently ripped off in one of the explosions. The blasts occurred about 100 yards (meters) apart on Sukhumvit Soi 71, a multilane thoroughfare that is home to businesses and apartment blocks. He gave no other details. Expect a Google doodle when you visit their homepage today? Google celebrates this year's Valentine's Day with an animation. Whether we like it or not, and no matter what others say, this day is dedicated to LOVE. May your life be filled with LOVE today and forever more..
Adele is the big winner at the 54th Annual Grammy Awards winning six awards. Nominated for six awards, she sweeps them all. The 23-year-old British, claimed three of the music industry's top awards, album, record and song of the year, and added best pop solo performance, pop vocal and short video to her stack of trophies. Foo Fighters come in second with five awards while Taylor Swift takes home two awards - Best Country Solo Performance: "Mean" and Best Country Song: "Mean"
A milestone for South Africa. A new item of interest for numismatists. Nelson Mandela's face will feature on all South Africa's bank notes to honour the former president's role in fighting apartheid - a befitting tribute to a man who became a symbol of this country's struggle for freedom, human rights and democracy, President Jacob Zuma said on Saturday. 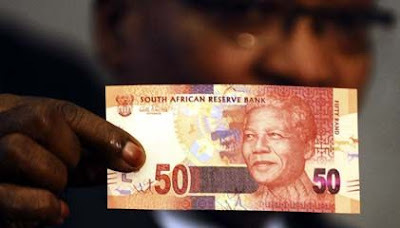 The new notes will be in circulation by the end of the year. Nelson Mandela became South Africa's first democratically-elected president in 1994. 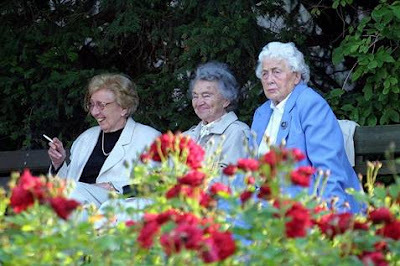 According to reports, the frail 93-year-old has not been seen in public since the closing ceremony of the Soccer World Cup in Johannesburg in July 2010. Oh my goodness, this is so up my alley. Love it! This outfit was spotted among others on the streets in Paris during the Fashion Week. 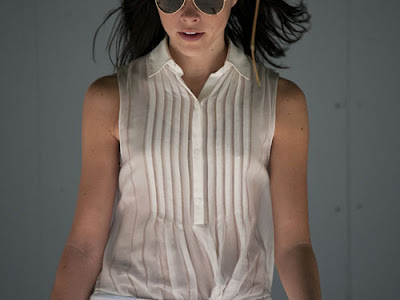 More street styles if you are interested.. Picked out a few of my favorites. Now this is a sweet combo.. 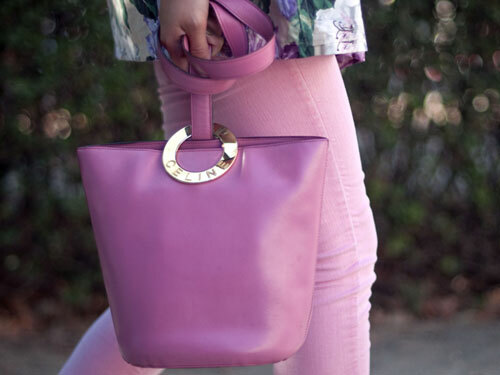 Pink pants and purple Celine bag..
A familiar piece in my wardrobe.. This ensemble I love too.. the bag, the bag! Alright, the list wouldn't be complete without shoes. 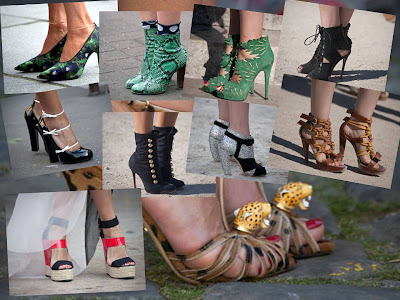 Here are just a few spotted on the streets of Gay Paree. Bags? Go check them out yourself.. This is shocking news! A sad day for her family, the music industry and for her fans around the world. Whitney Houston has died, at age 48. Whitney Houston was found dead today in a Beverly Hills hotel room, the Los Angeles Times is reporting. Paramedics arriving at the Beverly Hilton found the singer's body. While the cause of death is still unknown, Houston's publicist Kristen Foster has confirmed the sad news. Houston had been scheduled to attend the annual pre-Grammy party of music mogul Clive Davis, who discovered her, tonight and had attended rehearsals for the event earlier this week. CNN reports the party is still going on. Whitney Houston, the multimillion-selling singer who emerged in the 1980s as one of her generation’s greatest R & B voices, only to deteriorate through years of cocaine use and an abusive marriage, died on Saturday in Los Angeles. Los Angeles (CNN) -- Legendary pop singer Whitney Houston was found dead Saturday at a Beverly Hills, California, hotel, officials said. She was 48. The entertainer, whose incredible talent was discovered at an early age, was pronounced dead at 3:55 p.m. (6:55 p.m. ET) at the Beverly Hilton hotel despite resuscitation efforts, a police spokesman said. Listen to Simon Cowell talking to Piers Morgan about the talent of Whitney Houston on CNN..
R.I.P. Whitney Houston. We will miss you. If Feng Shui predictions are to be believed, are we seeing the predictions beginning to materialise so soon in the new year of the Dragon? This year's Feng Shui Bazi Chart and Flying Star Chart indicate afflictions primarily in the South-east sector due to flooding as indicated by the predominant water and wood elements in the Bazi Chart for the Year of the Dragon. The Year of the Dragon began on Jan 23 2012 lasting until Feb 9 2013. According to the Flying Star Chart, the countries potentially affected by the negativity would be the Asean region and Australia. The affliction would most probably be centered on floods including landslides, tsunamis, and so forth. Let's look at the current scenario. Heavy rainfall has caused serious flooding affecting areas of Queensland in Australia, the danger area being St George (coincidentally in south-east Queensland). ST GEORGE'S mayor says mandatory evacuations are running smoothly as the town braces for record flooding. This morning, Saturday, Strong tremors were felt in Tokyo as 4.7 quake jolts Ibaraki The Star reported that it jolted Japan's Ibaraki Prefecture in Kanto region at around 10:27am local time (0127 GMT) according to the Japan Meteorological Agency (JMA). The epicenter was initially determined at 36.1 degrees north latitude, 139.8 degrees east longitude, with a depth of 50 km, Xinhua news agency reported quoting the JMA. 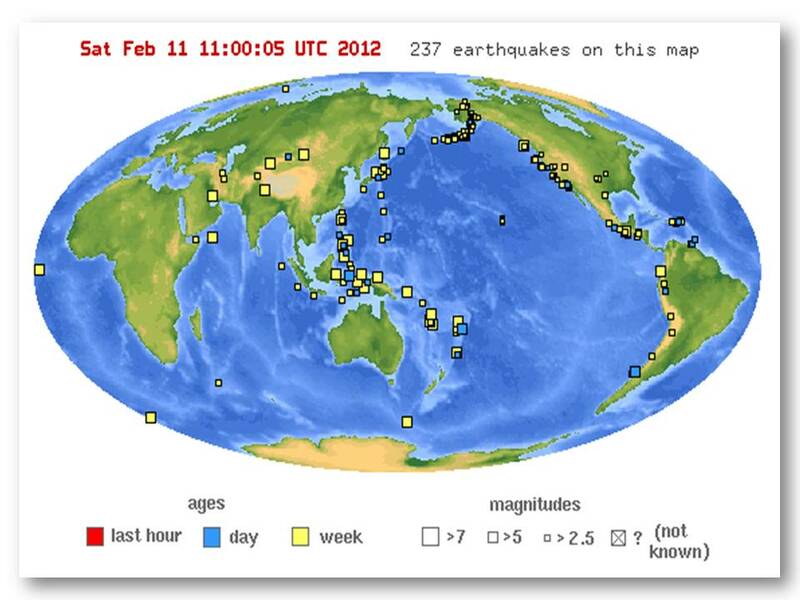 Strong tremors were also felt in Tokyo. There is no immediate reports of damage. Yesterday (Friday), the Lokon volcano in North Sulawesi erupted according to the Indonesian Centre for Volcanology and Geological Hazard Mitigation. A rumbling sound followed by the spewing of thick ash some 2,000m into the sky heralded the eruption at 8.20am, it said. People living in the vicinity of Mt Lokon have been advised to keep at least 2.5km away from the Tompaluan crater. The same morning in Fiji, a strong earthquake, measuring 6.2 on the Richter scale, hit the Fiji Islands region Friday, the Malaysian Meteorological Department reported. 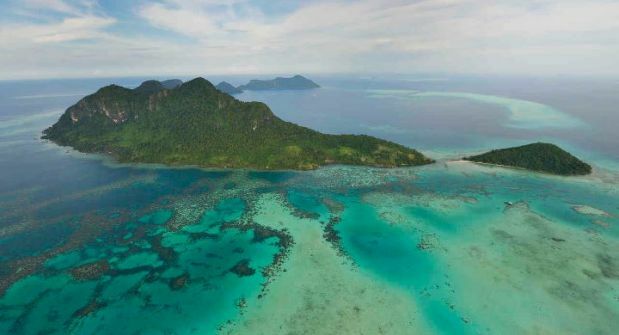 The epicentre of the quake, which occurred at 9.48am, was 22km north of Laucala, Fiji, and 7,028km southeast of Semporna, Sabah, it said in a statement. And in the afternoon at 1.34pm, a 5.8-magnitude earthquake struck Irian Jaya in Indonesia, the Malaysian Meteorological Department said. The epicentre of the quake was located 173km northeast of Sorong in Indonesia and 1,669km southeast of Semporna in Sabah. On Monday, in The Philippines, a magnitude 6.7 quake struck near Tayasan town on central Negros island, damaging bridges, highways, some public buildings, and toppling power and communications lines. Churches and houses were also destroyed. The death toll from landslides has risen to 35 and scores of missing are feared dead as rains and aftershocks hamper rescue efforts, disaster officials said on Friday. More than 1,400 aftershocks had been recorded since Monday, making it difficult for rescuers to search for survivors due to unstable ground and softened by several days of rains. As for Malaysia and Singapore, the two countries have a better Bazi this year hence, we will not be having much excitement in the form of natural disasters. Keeping fingers crossed though. Also, things will be looking up for the U.S. this year, the U.S. being in the Wealth Star (Star #8). A better economy ahead according to the reading. For your reference is the Flying Star Chart borrowed from Foong PC's blog. Whether we believe in Feng Shui or not is immaterial. Nature will take its course regardless. 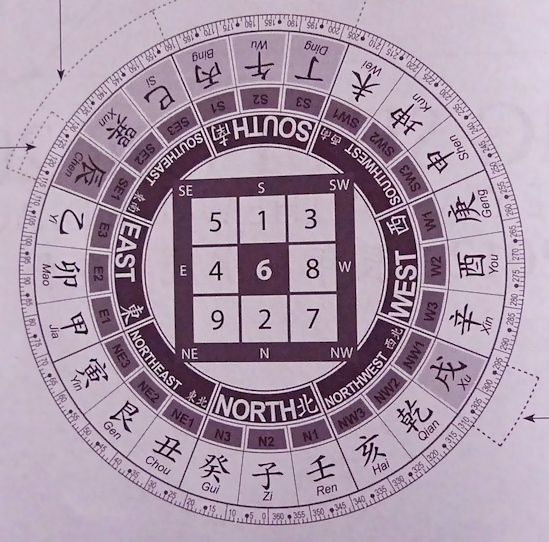 The ability to interpret the Bazi Chart and Flying Star Chart provides a way to have an idea of what lies ahead. 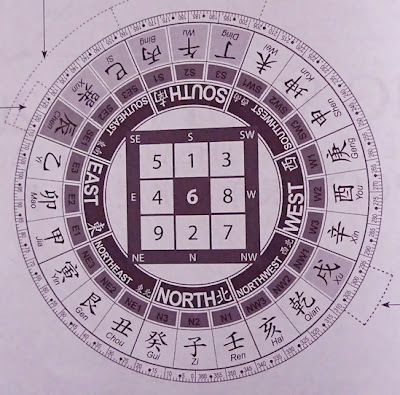 If you are interested to know more about Feng Shui for this year, head on over to Foong PC's blog. He attended both Lilian Too's January 1 talk as well as the English and Cantonese sessions conducted by classical Feng Shui master, Joey Yap. All sessions were held at the Plenary Hall of the KL Convention Center (KLCC) in Kuala Lumpur. Headlining most newspapers today is news about the incident at a KFC outlet at i-City, Shah Alam, Selangor. Here is the video if you haven't seen it. Friday Frolics - Are you an Extrovert or an Introvert? Do you think you are an Extrovert? Or maybe an Introvert? Take the quiz to find out. People collect different things for different reasons. Stamps and postcards are common items people collect. Others collect bracelets, watches, Barbie dolls (a friend is collecting these), all things ducks, all things frogs, etc., paintings, cars and the list is endless. Yet another girlfriend collects charms and recently bought a wolf charm to add to her collection. She's a huge fan of Jacob of Twilight fame so that explains. I was at Low Yat Plaza two days ago and saw a USB thumb-drive in the shape of Doraemon and thought of a regular visitor to my blog who collects all things Doraemon. Any idea who he is? England's football manager, Fabio Capello, resigned after a meeting with Football Association chairman David Bernstein and general secretary Alex Horne at Wembley. Capello, who disagreed with the FA's decision to strip John Terry of the England captaincy pending his trial in July over alleged racial abuse of QPR's Anton Ferdinand, took over in December 2007. 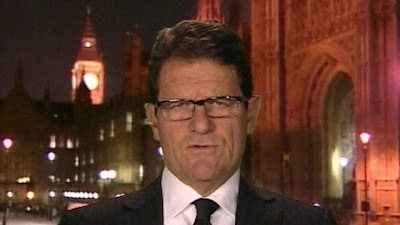 The £6m-a-year contract was due to expire in the summer, but Capello left the job following a meeting with FA chairman David Bernstein and general secretary Alex Horne. Capello has taken England to the European Championship. Tottenham boss Harry Redknapp receives strong support to succeed Capello. In public Harry Redknapp is the affable, well-respected, cheerful Cockney who is loved by football fans across the country. Harry is currently managing Tottenham Hotspurs who is currently at third placing (with 50 points) on the English Premier League table, five points behind second placing Manchester United and seven points ahead of Chelsea at fourth. Harry Redknapp should succeed Fabio Capello as the next England manager now he has been cleared of tax evasion, says former coach Sven-Goran Eriksson. Former England captain Alan Shearer, speaking on BBC Radio 5 live, said: "I am shocked and amazed - I'm really surprised. "Let's face it, Capello has taken England to the European Championship but if he doesn't want to go then we need to get someone in who does care. "England should be managed by an Englishman. Harry is an outstanding candidate, Roy Hodgson is in there too. Former England defender Martin Keown: "It's astonishing. An amazing turnaround. "I support the FA in what they have done but I feel, looking back, that if John Terry had resigned the captaincy then Fabio Capello wouldn't have had to fall on his sword. Protocol would have been to toe the line but he came out and said something to the contrary. "It leaves us with a massive hole, four months before a major tournament. Players can survive these situations, they are selfish enough to do that. 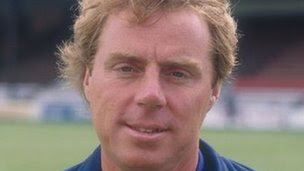 "We see Harry Redknapp as a long-term successor and it is an incredible day for the Redknapp family. Ex-England midfielder Paul Gascoigne told Sky Sports News: "He's (Redknapp) a day-to-day manager, he loves going into work every day. "I think the obvious choice for everyone is Harry, but I don't think Tottenham are going to release Harry. "He is a players' man. Everyone would want to play for him and he's proven that at the clubs he's been to. "If Harry didn't want it and Spurs weren't willing to let him go I would give that man Terry Venables a shot again. "That man is just an unbelievable manager and Harry is a similar type of bloke." Striker Wayne Rooney: "Gutted Capello has quit. Good guy and top coach. Got to be English to replace him. Harry Redknapp for me." Defender Rio Ferdinand: "So Capello resigns....what now...."
Midfielder Jack Wilshere: "People have their own judgement on Capello but for a young player who was given the chance to play for my country at such a young age he has shown great belief and trust in me so I can only thank him." Right-back Kyle Walker: "Gutted to see Fabio Capello go, he put a lot of trust in me and gave me my first cap. just want to say a big thanks really." Now that Chinese New Year is over, shopping for another occasion is on the cards, gifts for Valentine's. Do people stress over what gifts to buy? Do you? 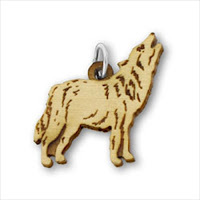 Gifts for Valentine's Day truly covers a wide range. Lingerie must be quite popular, at least among a few guys here in the office. Saw them checking out a discount lingerie store. I must say their lingerie sets would make any girlfriend happy, and the boyfriend too since they won't make a big hole in his wallet. Guys, what would you want most for Valentine's from your loved one? Oh gosh, he seems to be everywhere of late or am I being overly sensitive to his presence at every little function? Or perhaps the general election is imminent? He, is none other than our Prime Minister Datuk Seri Najib Tun Razak. In this image in The Star, he was officiating the Thaipusam celebration at Batu Caves. 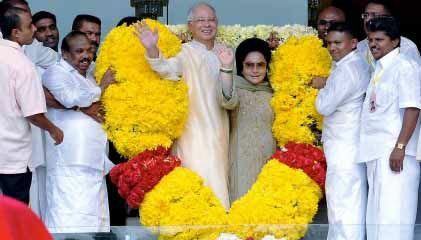 Beside him is his wife, Datin Seri Rosmah Mansor. 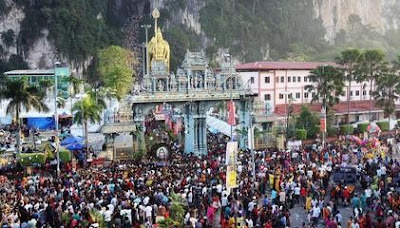 Hindus celebrate Thaipusam today Devotees and tourists throng Batu Caves for Thaipusam.